What a wonderful bilingual book! The story is told in both English and Spanish on each page. It is a longer story, but totally worth it!When snow interrupts the day and everyone is staying home it is a perfect time to learn how to make tamales!! This is the story of how we pass skills, lessons and values from one generation to another. 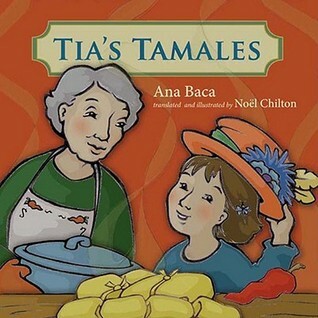 Tia tells the original story of how she learned to make tamales as she is teaching the new generation! It is richly detailed and such a warm story about family, caring and working together. I even asked a friend who always speaks Spanish to her children, and she told me it would be such fun to read to her own children. Of course, she would read it in Spanish!! I must have this one for our school library! 'Tía's Tamales' is a multilingual child's book written in English and translated entirely into Spanish underneath each grouping of text. In this story, a young girl named Luz spends the day with her Abuela and learns not only how to make the family recipe (tamales), but more importantly she learns about what life was like for her Abuela's father Diego during his childhood in years past. Instead of being discouraged by the lack of ingredients in the pantry, Diego and his Tía set out on an adventure to collect the ingredients in various resourceful and creative ways. The combination of folklore and traditional cuisine represented in this story allows for a vibrant celebration of cultural diversity, and the collection of characters in this novel reflect multiple generations. This story will assist children in recognizing the value of one's history and extended family, and will help them to value parallel figures of authority and wisdom aside from one's parents. Bookaday #23. Bilingual story about a resourceful aunt and her very useful hat. Reminds me a bit of the Tia Lola books. Lots of text, reads smoothly in both languages. Honestly, the frame device is poorly done, both visually and narratively, even if it's a cute story underneath it. A charming story that encourages children "encontr[ar] una alegría sorprendente en un día común."